There is no point in comparing DreamWorks Animation’s Mr. Peabody & Sherman to its earlier incarnation as a regular segment on 60s cartoon The Rocky and Bullwinkle Show, for two very good reasons. One, we could be wrong about this but The Rocky and Bullwinkle Show was never as big a hit in the UK as it was in its native America and thus we don’t know anyone who could have watched it and/or remember it well enough to remotely care (and for those about to bring up the 2000 movie The Adventures of Rocky and Bullwinkle, pipe down!). And two, as a direct result of reason #1 this reviewer has neither seen nor researched the original Peabody’s Improbable History segments on which this new film is based. Like most other adaptations, it shall be judged purely on its own merits. And on its own merits, the movie is… eh. Put it this way, it’s far better than the studio’s Turbo (but let’s be honest, anything would have been considered a step up after that flop). But it’s nowhere even near the highest-standard line of products like How To Train Your Dragon or Kung Fu Panda. That may put off older viewers a tad, but should spell delight for its younger audience members. The idea of a time-travelling genius dog voiced by the dad from Modern Family is silly kid’s stuff, but it does try to have fun with it. It doesn’t just slap a half-assed product together with the insincere belief that kids won’t tell the difference because they’re “stupid”; there is definite effort on display here. On one of the many journeys through time our main characters experience, there is a nice sequence where at-odds classmates Sherman (a fine vocal performance from Max Charles) and Penny (Modern Family’s Ariel Winter, who has fun in an otherwise underwritten role) fly about the Renaissance-era Italian town on Leonardo da Vinci’s flying contraption. While not as breath-taking as How To Train Your Dragon’s flying scenes, it’s still captivating in its own little way with good animation and decent use of 3D. The point being, scenes like that need passion from its filmmakers for it to work and you can sense that they certainly had that while making it. However, its reliance on familiar storytelling tropes is distracting for older viewers. In hindsight, the minor sub-plot of a snooty child services agent inspecting the domestic goings-on of the Peabody household – after all, a dog raising a human is “wrong” according to some people – could have been left out. It’s painfully clear that dog and boy are not going to be separated in this family-friendly adventure (though wouldn’t THAT have been a dark turn? ), and it makes the entire situation bereft of tension and drama. A possible romance plot between Sherman and Penny is brought up but rarely ever mentioned again; and the climax, while fun and creative at times, resolves itself in an underwhelming and highly predictable manner. Also underwhelming is the film’s large waste of a talented voice cast. Though Ty Burrell is a fine presence as Mr. Peabody, other talents like Stanley Tucci (as da Vinci) and especially Stephen Colbert (as Penny’s father) are criminally underused in significantly smaller parts, leaving you aghast as to why they were even put in these bit parts to begin with. Seriously, anyone could have played those parts so what was so significant about these particular performers? 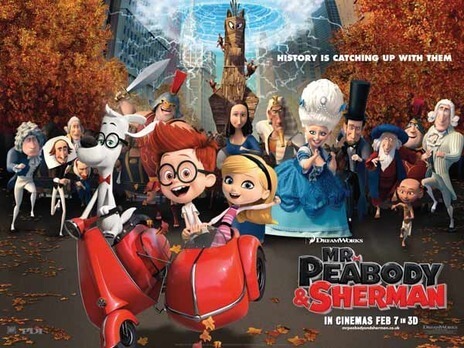 Aside from a few amusing gags for adults (a brief Bill Clinton appearance in the climax raised the biggest chuckle out of them), Mr. Peabody & Sherman is probably best suited for your younger offspring who can’t wait until The LEGO Movie finally comes out. Mr. Peabody & Sherman is not outstanding, but far from awful due to its clear passion behind the camera and amusing, if not wholly hilarious, historical anecdotes. One for the young ones, really.